I'm Curious Too: Can You Really See The Great Wall Of China From Orbit? 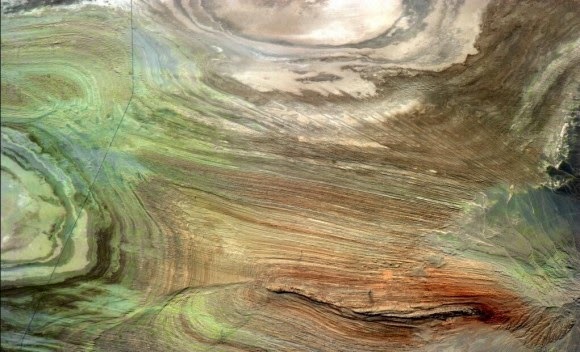 Can You Really See The Great Wall Of China From Orbit? Legend has it that the Great Wall of China is the only man-made structure that can be seen with the naked eyes from orbit. However, according to Canadian astronaut Chris Hadfield, who had just returned from a five-month mission aboard the International Space Station, it is not possible to see the Great Wall of China from orbit. So you're telling me that it is not possible to see a 8850km-long man-made structure from another man-made structure parked 330km above the surface of the Earth? Well, to be fair, the Great Wall is long. But it's also narrow, around 4.6~9.1m wide at the base and sloping to 3.7m at the top. Moreover, the Great Wall follows the natural contours and colours of the land, making the task of spotting a 9-meter wide structure from 330km away next to impossible. China’s first astronaut, Yang Liwei, reported during his trip into space in 2003 that he couldn’t see the structure of the Great Wall from his capsule window. 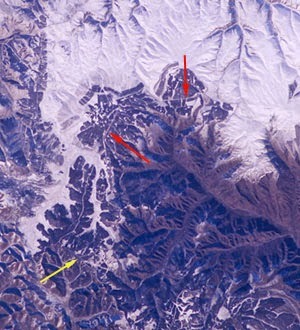 US astronaut Leroy Chiao took what is thought to be the first verifiable image of the Great Wall of China from the International Space Station in 2004. He photographed a region of Inner Mongolia, about 200 miles north of Beijing. He added that he didn’t see the wall with his unaided eyes, and wasn’t sure if the picture showed it. This photo of central Inner Mongolia, about 200 miles north of Beijing, was taken on Nov. 24, 2004, from the International Space Station. Image: NASA. So if you can't see the Great Wall from the International Space Station, you will certainly not be able to see it from the moon. There are, however, some man-made structures that can be seen from the International Space Station. Space Station astronauts have said the ancient pyramids at Giza are relatively easy to see out the window, but most visible are roads or long bridges across straits. Astronaut Nicole Stott posted this image on her Twitter account. Can you spot the pyramids in this picture? Click at the photo for a larger version, or look at the image below if you can't find the pyramids. Image: Nicole Stott twitpic feed. The straight line on the left there is a road. 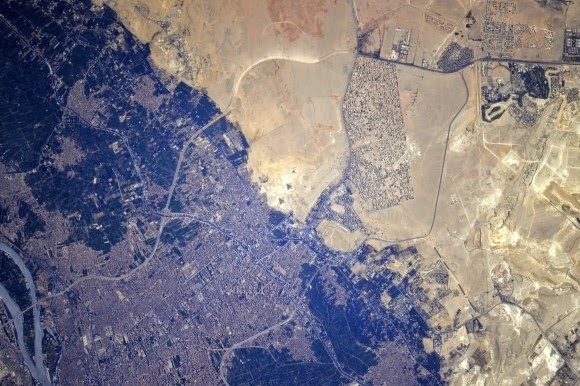 ‘One straight human line drawn onto incredibly rough terrain,’ said astronaut Chris Hadfield about this image. Image: NASA/Chris Hadfield. But the gap in the Manchester United defence is clearly visible from space. And also Kak Rose's hair.